ATHENS, Ala. -- An Alabama mental patient who died after being shot with a stun gun began having breathing difficulties within minutes of receiving the jolt, according to a police video obtained by CBS affiliate WHNT. The more than nine-minute video from the body camera of Sgt. Dusty Meadows shows officers and medical workers trying to calm 49-year-old Randy Joe Nelson at Athens-Limestone Hospital on Feb. 3. Nelson is shot with a stun gun and loses consciousness within minutes. He died five days later at another hospital. Athens police released the video on Wednesday. Police Chief Floyd Johnson released body camera footage and gave a brief statement, according to the station. He said the video had been edited to protect the identity of witnesses and the dignity of the patient. Warning: Videos contain content that may be considered graphic. Johnson declined to answer questions, citing the possibility of a lawsuit, the Decatur Daily reported. 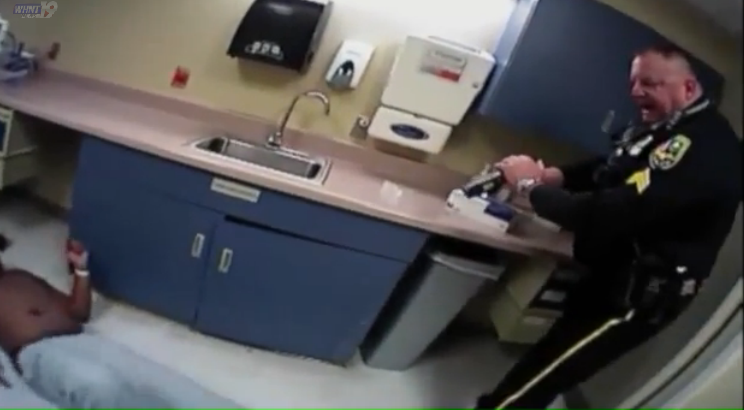 The video shows Nelson growing agitated as officers help hold him on a bed for a medical worker. Nelson gets up, flails his arms, strikes a wall and knees a man as an officer tells his mother, Dorothy Nelson: "Mom, I'm going to have to tase him, and I don't want to, but I'm going to have to, OK?" Sgt. Greg Lott later shoots Nelson in the back with a stun gun and the man falls, possibly striking his head on a counter. Police and hospital workers struggle to get the man onto his stomach and handcuff his hands behind him. With Nelson on the floor, someone asks if he is breathing. "He's kind of blue right now," a man responds. A female hospital worker mentions the possibility of inserting a breathing tube before Nelson is wheeled out of the room on a gurney. Nelson was transferred to Huntsville Hospital, where he died Feb. 8 after doctors removed life-support equipment. Nelson's mother described him as having bipolar disorder and said she took him to the hospital in Athens because his condition was worsening. Court records show the man had a history of mental problems that led to previous encounters with police and arrests.